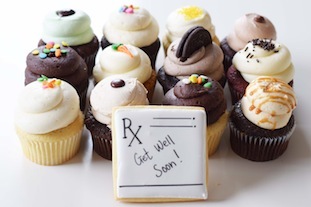 Send the perfect gift of cupcakes and wish someone to "get well soon!" 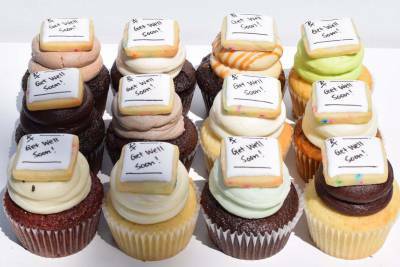 These get well soon gifts taste totally awesome and are guaranteed to make someone's day. Help a friend or loved one feel better with a gift of delicious cupcakes. Wish them good health and to recover soon from there challenges in this sweet way. With these gifts we have included a Get Well Soon themed sugar cookie to make it extra special. Our regular Toronto cupcake delivery is free with every gift. Send your unique get well soon gift with the best cupcakes in Toronto today!